This is a hand-made Semi-Precious Amber and Onyx necklace. 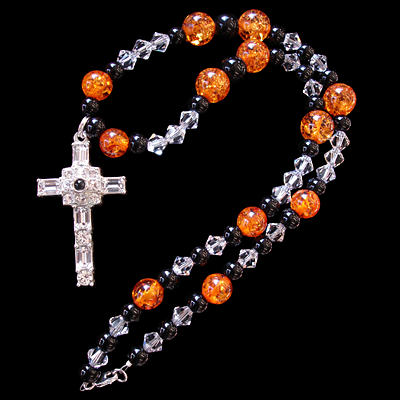 Clear Swarovski crystals, black Onyx, and Sterling Silver complement the Amber. The necklace closure is a lobster claw clasp. The amber necklace features a stunning solid Sterling Silver cross pendant accented with authentic Swarovski crystals. The setting is solid Sterling Silver that is very shiny and polished. 'Grace' has a total of 5 Swarovski octagon Clear crystal rhinestones and 10 round Clear crystals. A peep inside the lens reveals a crystal clear and legible image. There are many images to choose from including Jesus, The Holy Family, Ten Commandments, Psalm 23, L'Ascension, The Lord's Prayer in English, Spanish, Hebrew and quite a few others. The Amber & Onyx necklace measures approximately 16 1/2 inches. 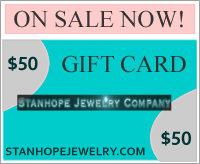 The Grace Clear Swarovski stanhope cross pendant measures approximately 7/8 inches x 1 5/8 inches.